As part of my residency at EUROCLIO, I attended the Annual Conference in Gdansk, Poland, where I presented a workshop entitled Photographic Sources: Bringing History to Life? : Using online tools to promote historical thinking. The workshop took place on the 7th of April and was attended by over 20 participants from all around the globe. The focus of the workshop was on the use of the Historiana website which provides teachers with a wealth of historical content, teaching and learning activities as well as a tool with which to build their own online activities for students. Numerous source collections curated by EUROCLIO staff, trainees and volunteers. Many of the sources used are drawn from our partner, Europeana, an online portal which provides access to over 50 million digitised sources from thousands of European archives, libraries, museums and audio-visual collections as well as their own online collections and galleries. For this workshop, we concentrated on The Visual Front source collection which provides many examples of official war photographs from various nations, all taken during the First World War. These sources were collected from the Imperial War Museums and, like all source collections on the Historiana website, assembled with contextual notes for use by teachers in the classroom. The Visual Front source collection highlights the nature of official photography and its tendency to emphasise and deemphasise aspects of the war, often staging photographs for propagandistic purposes. This collection provided the perfect springboard for discussions of how to support students to question the assumption that photographs always capture things as they really were and encourage them to critically analyse photographs in the same way they would any other historical source. Participants took part in a rich discussion about the types of questions they would ask students to consider when presented with one of the photographs from the collection. 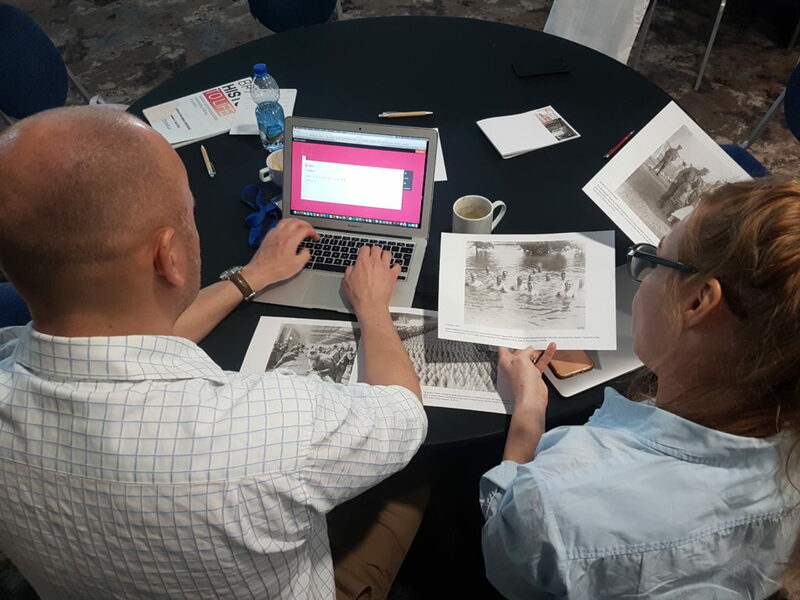 After looking at a few examples, participants worked in groups to create their own eLearning Activity focusing on the usefulness of photographic sources from The Visual Front collection. These activities were presented at the end of the session and ranged from tasks for assessing how realistic the photographs were, to those centred on considering the impact of the photographs as well as those which explored the representation of women and their roles in the collection. The range of activities developed in this short space of time provides an excellent example of the vast variety of activities that teachers can develop with this tool for use within their specific teaching contexts. Cory Callahan. ‘Analyzing Historical Photographs to Promote Civic Competence.’ Social Studies Research and Practice 8, no. 1 (2013): 77-88. Sam Wineburg. ‘Historical Problem Solving: A Study of the Cognitive Processes Used in the Evaluation of Documentary and Pictorial Evidence.’ Journal of Educational Psychology 83: 73-87.